President Aristide wanted Haiti to change for the better. So did Rene Preval and Michel Martelly. Current Haitian president Jovenel Moise wants to make Haiti better but none of they could or can because there is an ANTI-CHANGE force in effect in Haiti who want things to stay just the way they are, says Garry Pierre Paul Charles, Journalist and political analyst on radio SCOOP FM. This force "ANTI-Changement" is in every sector in Haiti and they are ready to swallow you whole if you want to bring about change in Haiti and make the country better. Aristide tried and failed. He wanted to change the country and they gave him two coup d'Etats. President Preval tried to negotiate with them but that didn't help. President Michel Martelly tried but at the end they swallowed him whole and took total control of his presidency. "President Michel Martelly said Haiti is Open for Business and they made him swallow his words," Journalist Presimon Jean Marco said. President Jovenel Moise is trying like hell but this "Force Anti-Changement" is doing the same thing to him, making sure he fails. Nothing he tries is working. The journalists argued this "Force Anti-Changement" is everywhere, not just among the rich in Haiti. It is a group of people who profit from Haiti's misery. It is in every sector in Haitian society, it is a system that is put together and it is well put together. It is a system of "blockage" of all national projects in Haiti. "If they give you 20 million dollars for a road construction project Haiti where you were supposed to build the road with 16 million and earn a 4 million profit. You start building the road with 3 million dollars and you separate the rest of the money like a pizza pie, you are part of that force anti-changement." Question: If we are smart enough to identify that such a force exists, how do we fight it? We have to, Haiti cannot remain in this constant misery at the profit of a few corrupt people. 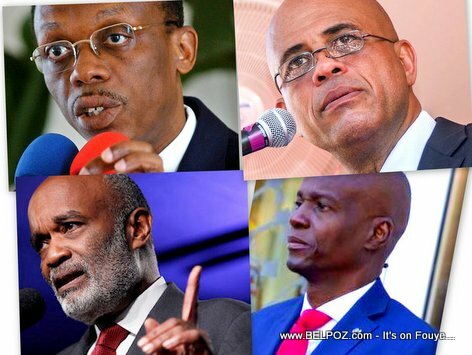 Aristide, Preval, Martelly et Jovenel, les quatre derniers présidents haïtiens élus voulaient changer le pays. Ils ont tous essayé et ont échoué.